I think the scarf looks lovely! I think you will find that blocking it will relax the stitches and make it look fabulous. If you think the smaller needles are really a problem, you could try doing a swatch on larger needles to see how you like it before frogging this. And phooey on Ms. Fat Ankles. Who knows what kind of horror of a house she lives in? LOL ! I loved this sophisticated insult. So everyone is getting trained at Bee & Jai's you say? Hey I quite liked the pattern and the color. 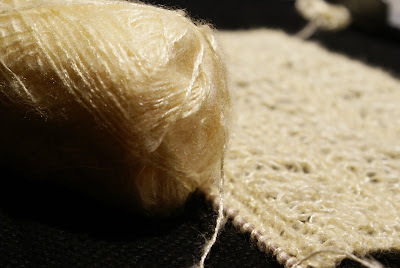 It almost looks like raw silk. It's pretty as is. But I can see that it probably wants to be even more delicate...Like Kitt suggests, try it our on larger needles then decide. You did not really tell her off, the Ms Snooty Interior Designer? Doesn't sound like you. Kitt, I hadn't thought that far! To blocking, that is. I have no clue how I will block a 52in long scarf! Any suggestions? How large do you think I should go? Size 11? Size 13? I have size 10 DPNs and that is the largest I have. Hellooo, Michael's! I'm really not sure why my house, its location, its size or lack thereof, etc make a difference to anyone. I've had someone who lived in a rented mansion in Rock Creek in Superior say to her husband: Even they have bought a house while we are still renting. They? I mean really, how lowly are we that we would not be able to own our own house? She wanted to know how many bedrooms. When I told her, she was aghast and was quick to say that the finally tally must include the office. Um, no. She was so upset that I calmed her down saying that they are all really really small. Divya, thank you! Do you knit? 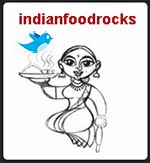 Anjali, I am just following all the trendsetters. Priya, Bee. You could be next! Anita, I think so and I think that is what Medha was getting at. I don't have years. I don't even have a month. I need this to reach before mid-Nov.
Nooooooo don't frog it. Its pretty and delicate. If i were the recipient i wud love it for the effort u put into it and the fact that its handmade by a friend. keep going, it looks just fine! Made up houses and made up women, long nails and all, hard to live in and hard to live with don't you think? The scarf looks really pretty. I am not qualified to offer any suggestions. U sure give right looks to people who deserve! :D I m not into knitting, no clue of needles but yes..the work you hv done looks good to me! Too good to b wasted! The scarf is absolutely gorgeous, though it looks different than original, I love it. I have seen this kind yarn in Micheals, but I thought it might break easily by the amount of tension I apply while knitting/crocheting. It looks so delicate. Probably I was wrong. I loved to read thr' your experience. I simply hate such such people. Very pretty scarf. I'd be over the moon if a friend sent me something like that. No, don't!!! It looks so pretty. Can't stand those annoying condescending types, with their fake claws and patronizing talk. I remember, walking into some random haute-couture store while visiting a new city, the heavily made-up sales associate with her nose up in the air asked me, "So what brought you to this store?"!!! Whatever brings the others to their store! And why was I singled out and asked this question. The scarf looks absolutely elegant and so is your "creative Writing"
When you block it, it will look very different. Lace is magical like that! Maybe slightly bigger needles next time... but you may be surprised. Excellent! Excellent! your post today and your knitting. I loved both, so much so that I had to delurk. Its tough commenting on your blog, I can never remember my google password (had to reset it now). I am enjoying you Nablo.. whatever. Your writing is inspiring.. 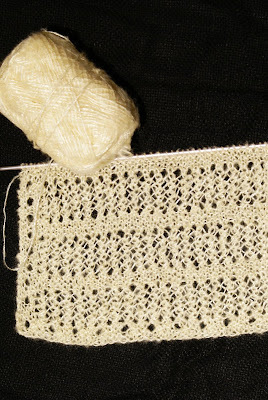 I cant knit or at least havent tried it since high school and now I want to knit my dau the scarf. Looked at your pattern, but twas Greek. But I'll get there. the scarf does look pretty Manisha, its looks really delicate, something that you would want to take good care off :) please don't frog it, you could use it as a place mat, if nothing else, on your table ? and claws are the right word, why would anyone want to have such things on their fingers, and it really irritates me seing them type with those things...aaah! What people!! I mean, this babe needs serious lessons! And the person who made the remark "they.....", it's so surprising that people stoop to such low levels! i wonder what it is that makes them do so. Inferiority complex may be? Besides, my house is my comfort zone, and it's tough to understand why it should be anyone's concern on how i "decorate" it, unless i hire them for this purpose. And Manisha Tai, that pattern is beautiful! Nags, thanks! But now Kitt has put a be in my bonnet and I need to at least try a swatch! Nirmala, the line is growing longer! I'd love to but I just don't know how! I wish I worked faster and I wish I had more time! Indosungod, there are those who love to look good and they do it for themselves. These people are usually secure in themselves and don't feel the need to put others down to feel good about themselves. This woman was not one of them! Purnima, it's never wasted per se. It's part of the learning process. Just like what I tell Medha when she gets frustrated at a mistake she made. Shilpa, this yarn has to handled lightly and you need to loosen your gauge slightly. Large needles help. It is fairly strong and will not snap or break easily. Try it. And thanks for letting me know that the delft blue yarn for the Special Olympics scarf can be found at Wal*mart. My local Wal*mart did not have it but apparently they have new colors that had come in but were not yet up on the shelves. So I might try again this weekend. Bharti, well, I've been sent over the moon so often over the past couple of years that it's my time to give back! Mamatha, I have to try what Kitt suggested. This is only a couple of hours worth of work - took me longer to do the first 2 sections of fishnet lace but now it's moving faster. So I should be able to catch up soon. Fingers crossed! Shankari, hee! You are so sweet! Laurel, please help me with tips about blocking something this big. 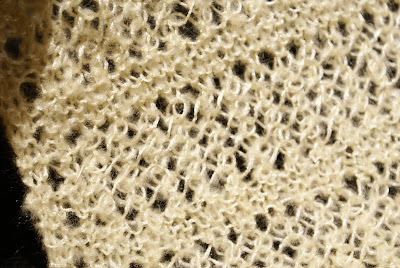 I don't have any blocking apparatus and I have been getting visions of softboard pins holding the scarf up on my wall! Anita, I am sure you will find yarn like this in India. 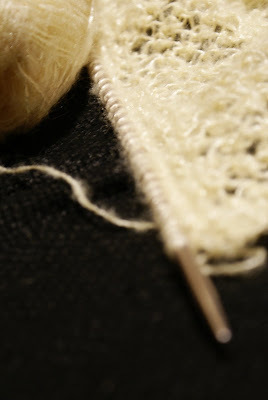 It's not like wool or acrylic and so will be easy to knit with even in warmer months. But you have balmy weather right now - so make one! Vanamala, thanks! Do you like to knit or crochet? Angela, red checks, baby! Only for a short 3.5 year stint though and several eons ago. :-D Pick a simple password and have your browser remember it for you. Believe me when I say I don't know much about knitting either but I haven't let it stop me. There are a ton of how-to videos on the net. Sign up at Ravelry - there are a zillion free patterns. Start with small simple patterns and gain confidence - you'll do just fine. It's like riding a bike - you don't forget! So glad you delurked! Musical, and this was on the first meeting. We did not have much to do with those people. I have since heard that they have left the area and returned to India. Good for them. I agree with you - my home is precisely that. My home. Not a museum. It may not be perfect but it works for us and very well that, too! My neighbor, a senior, is a part-time masseuse and had a similar run-in with one of her customers. The woman stepped in, looked around and said: what a wonderful little place you have here! It's the 'mine is bigger than yours which makes me better than you' syndrome. Oooh those nails!! There is a slaeswoman in our local walmart who has nails like 12 (oh alright, 6 inches, not kidding) inches long and she paints them in ALL possible colors! Scary I tell ya, but what makes it yuck! to look at is when she tries and opens the glass cabinets with her bunch of keys.. God! One tends to reel back in horror and gasp and say, " I say! is it halloween ALREADY??" As for the scarf, it's LOVELY.. so delicate and looks so soft! If I were as lucky to have someone make it for me, why I'd be strutting around showing it off! Manisha, you can block it on a bed. The yarn is thin enough and the air is so dry here. Dunk it, give it a couple of spins in the washing machine (i.e. put the machine on spin cycle without water in it and let the scarf make a few rotations), then pin it out on the bed. You can put a fan on a chair next to it to speed the drying. Touche! is all I can say for that last comment! Hope you do get that discount!